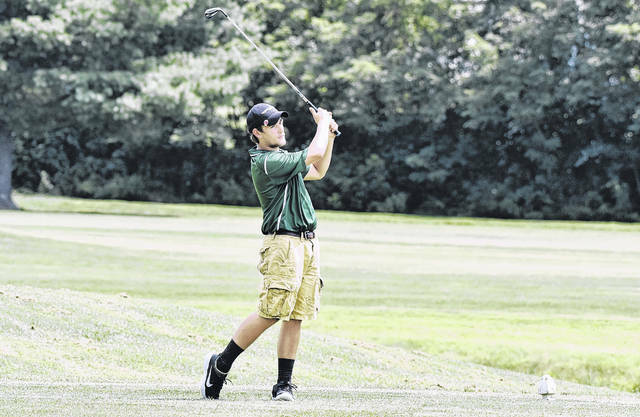 EHS senior Jasiah Brewer tees off during a Tri-Valley Conference Hocking Division contest on Aug. 7 at Cliffside Golf Course in Gallipolis, Ohio. CHILLICOTHE, Ohio — Moving on in Meigs County. The boys golf teams at both Eastern and Southern are headed back to the district level after qualifying out of the Division III sectional tournament held Wednesday at the Jaycee Golf Course in Ross County. Both the Eagles and the Tornadoes earned repeat district berths with respective finishes of second and third overall in the 11-team, 14-school field. Eastern claimed the runner-up spot with a team tally of 362, while Southern was two shots back in third with a final score of 364. Crooksville claimed the D-3 sectional title by 18 shots, posting a winning tally of 344. Waterford (389) and Southeastern (399) claimed the remaining two district berths by rounding out the top five. The Eagles — who are headed to their second straight district tournament and third in four years — were led by Ryan Harbour, who shot an 85. John Harris was next with an 89, followed by Kylee Tolliver with a 93. Jasiah Brewer completed the team score with a 95, while Nicholus Durst also fired a 105 for the Green and White. The Tornadoes — who qualified for their third consecutive district and fourth in five years — were paced by Landen Hill with an 86. Joey Weaver was next with a 91, while Ryan Acree followed with a 93. Both Jensen Anderson and Jarrett Hupp shot identical rounds of 94 for the Purple and Gold. South Gallia saw its season end as Noah Spurlock — the Rebels’ lone competitor — posted a final score of 152. Hunter Dutiel of Miller claimed medalist honors with a 2-over par round of 74. Brock White of Crooksville was the overall runner-up with a 79. The five individual district qualifiers — which came from non-qualifying teams — were Dutiel, Eric Dotson (95) and Matthew Deems (97) of Belpre, Kameron Reed (99) of Paint Valley and Tyler Stephens (99) of Lynchburg-Clay. The Division III district golf tournament will be held Monday at the Portsmouth Elks Country Club in Scioto County. Visit baumspage.com for complete results of the 2018 Division III sectional golf tournament held at the Chillicothe Jaycees Golf Course.